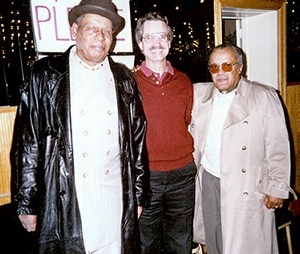 "The Beat Of Our Hearts"
Above Left: Andrew Magruder was an original member of The Five Blue Notes, who were from Washington, DC. Also in the group were Fleming Briscoe, Robert Stroud, Moise Vaughn and Jackie Shedrick. This photo is Andy with The Spaniels in 1960, Pookie Hudson is on the right. Above Right: Here are Pookie, Tony (yours truly) and Andy at a UGHA concert in New Jersey in 1997. Above: Andrew Magruder does the lead on "My Gal Is Gone". 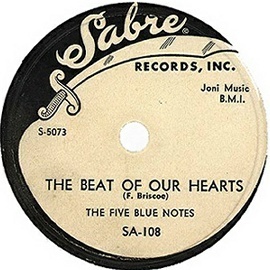 Fleming Briscoe does the lead on "The Beat Of Our Hearts". 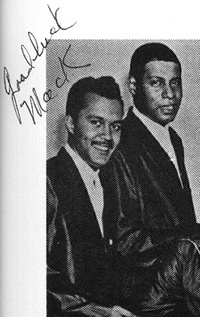 Sabre was a subsidiary of Chance Records in Chicago. 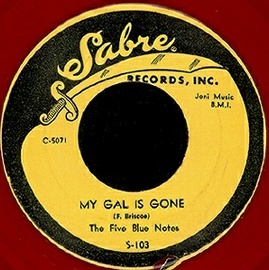 Click on an option below to listen to "My Gal Is Gone" in RealAudio. Click on an option below to listen to "The Beat Of Our Hearts" in RealAudio.